Still nothing. The listing is there, but it's NOT available for streaming. That's bizarre, I see comment from people who seem to have seen it on Netflix and the cache page I saw made it seem it was available as well... Probably another territory limitation then? Agreed Skin Trade and Don't Kill It are the best on there. Amazon Prime US has a much better selection of Dolph movies for streaming. I finally ordered a copy of the German blu-ray... bringing my total of copies of this on blu-ray to 3.. what is wrong with me. Only 3.. at this point. Anybody in the Detroit area on April 15? Free screening! 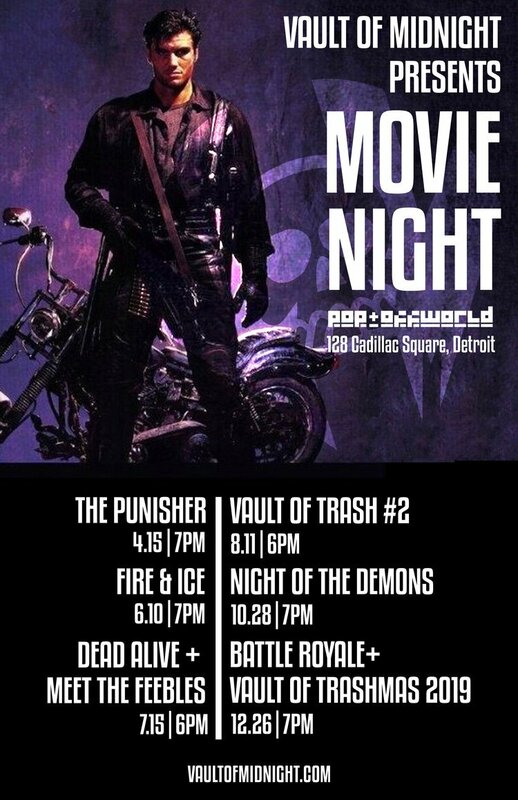 "Vault of Midnight presents THE PUNISHER at POP+Offworld on Monday, April 15th. We're commemorating the 30th anniversary of the worldwide release of Mark Goldblatt's THE PUNISHER written by Boaz Yakin and starring Dolph Lundgren, and we'd love to celebrate this staple of American cinema with you. Just read on this forum that the Japanese Blu Ray Edition workprint has has one additional deleted scene not presented in Koch Media Blu Ray and other ! Basically another workprint featuring Louis Gossett Jr character when he resigned from the police after talking with Castle in the prison !!! That first cover is amazing. alex.sp89 wrote: Just read on this forum that the Japanese Blu Ray Edition workprint has has one additional deleted scene not presented in Koch Media Blu Ray and other ! Basically another workprint featuring Louis Gossett Jr character when he resigned from the police after talking with Castle in the prison !!! It's not another "workprint", it's a seperate 30-60 secs deleted scene that was taken off very very early on. (I own that edition so I confirm it but I can't make screenshots from the Blu-ray). Jox I know this scenes are posted on youtube, but the one with Gossett Jr. with a bottle in his hand in not presented there- everyone advertise it like never seen before (blu -ray forum) but no confirmation just stills and lobby cards !!! I want to see the quality difference on new Japanese Blu ray workprint ! Is it the same like on youtube or better !!! alex.sp89 wrote: I want to see the quality difference on new Japanese Blu ray workprint ! Is it the same like on youtube or better !!! The quality is much better (not ripped from a VHS copy of a copy) and likely comes from a Beta tape transfer that the Japanese distributors had kept. The scene with Gossett is short (30 to 60 secs I think). Sorry I don't have a Blu-ray player that I can use on my computer so I can't make any "direct" image.